Q. How do you get into it? Do you have to have a prior military background? A. Like most aviation careers you network and the best results are coming to the table with the most tools in your toolbox. The minimums to qualify as a copilot per the USFS contract are 800 Hours Pilot in Command, 100 hours in the last 12 months, FAA Multi Engine Rating, Instrument Rating, Commercial Certificate, Class II medical certificate, and meet the requirements of Federal Aviation Regulation (FAR) Part 61.55 and 61.56. In addition, since the attacks on Sept. 11, all pilots must pass an US government security background investigation. Being a military pilot or a previously P-3 rated pilot is not at all a requirement of our 24 pilots including myself, only a handful of us have any military experience. Previously it was a requirement that all the Captains have an A/P and aerial application experience that is no longer true either. What we look for is a well rounded applicant who can add to the company’s dynamic based on their experience. I like to see some part 135/121 or CFI time, some mountain flying experience, glider experience, and crew experience. Your primary job is to back up the captain, so your skills need to complement his. Q. What's the lifestyle like while on-duty on a contract? A. 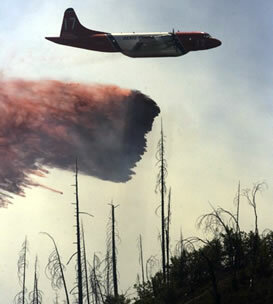 The fire season routinely starts in the South East and moves it way west, finishing in CA. 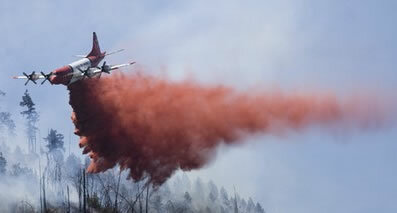 The USFS has 19 Large Airtanker Contracts, of which they are broken up into 180 day, 160 day, 150, and 140. The way the contract works is the crew is six days on, one day off. So a 180 day contract may turn out to actually be 210 days gone from home. Due to the limited federal assets you can be dispatched anywhere in the continental US at a moments notices. So that morning you may wake up in Lake City, Florida, and wind up that evening in Helena, MT with little notice. The day usually starts at 0900, but during heavy fire activity the crew will be called out as early as 0700. Due to the limitation of flying in canyons, close to the ground, we can fly only during daylight VFR on the fire. So the workday at the height of summer may last from 0700-2130, but typically in the summer we work about 11 to 12 hour days. While on the job, you are like a fireman and are on a 15 minute launch order to a fire. When not flying, you as the copilot can expect to be maintaining the aircraft. That means washing the airplane, sometimes even compounding the paint. Cleaning retardant and grease off, etc. Q. So, just to clarify. If you're in CA (regardless of where you'd realistically be based on your contracts) and there is a fire in WA, you would fly your aircraft up to WA with all you gear in the back and then land at some base and find a hotel from there and literally live out of the plane? Do you have a single (maybe a crew) mechanic that follows you and the plane wherever you go? A. That is exactly correct, you live out of the plane. There is a crew mechanic assigned per contract to the aircraft, and we carry a set of most typical spares onboard. Q. Is there a limit of how many contracts you can do in a year or can you get lucky and get a 140 day contract and be done for the year? A. The contracts all overlap at the height of the summer so you can’t go from one to the other easily. Q. Are there general pre-requisites that need to be achieved before someone can consider an aerial firefighting job with the government (for comparison, how a pilot would have to go to a regional first before going a major airline)? A. As mentioned before there are no preset key requisites other than the contract minimums, which are the bare minimums and usually do not get an applicant hired. The key driver is personality. With you and the captain being on the road, in close quarters for the better part of the year, how well do you match up, are you going to be able to take the hard life, etc. There are some jobs which lend themselves to getting hired. One avenue many pilots take is to fly Air Attack. They are on the same bases as the tankers, stay at the same hotels, and therefore are networking in a way. Q. When you're not on contract, off-duty, do you still do things for the firefighting sector or are you just basically off until you're back on duty? A. We always encourage our pilots to keep flying. Some get corporate jobs, others spray, and some just go home to spend time with the family. Their currently is no written requirement when off contract to do anything. That being said, there is annual recurrent training which is approximately two to three weeks a year. Q. Does the money you make while on duty earn you enough to survive for the rest of the year while you're off-duty? Is there any kind of limitation on how long you can do it (like the airlines have forced retirement at 65)? A. As long as you qualify per the FAA there is no age limit. You must get a Class II medical and complete our annual training class. I am not at liberty to discuss wages, and it is dependent on your lifestyle if you need to supplement your income. Q,Is it hard on your family to be gone for such long periods of time? A. Like any job that entails family separation, your family must be unique and prepared to continue with you gone for extended periods of time. If your spouse/family expects you to be home every night, this is not the lifestyle for you. Q. Do you still get paid when you're still just sitting around? Even if you're sitting for weeks on end? A. Most companies now salary their pilots. At one time many of the pilots were paid by flight hour, but now it is primarily salaried. The contracts are structured that the USFS “owns” the aircraft while on contract, so the company is receiving money. You will hear occasionally a contract referred to as CWN (call when needed) which CA does with the DC-10, and that means the aircraft is only paid for when called for. Q. What's the training like? When you're off contract do you do a lot of training or is that done while on contract? When "business" is slow while on contract, do you fly the airplanes at all to stay sharp or just wait for a call. A. The training consists per contract of recurrent instrument simulator training which is 8 hours sim time and 8 hours groundschool. We utilize an AOPA Safety Rep to give our pilots an additional 16 hours of CRM, Part 61/91 review, and SOP training. The pilots then receive two days of ground school directly related to the platform. Per contact they must receive seven hours of training of which two must be in mission profile typical terrain. Prior to being “carded” by the Forest Service, each captain must have a current medical, 61.58 check and 61.57 check. Copilots need to meet the requirements of 61.55. The contract requires proficiency flight if the aircraft doesn’t fly for so many days, which in most seasons, does not happen often. Q. What's the longevity for career progression generally like? I know this is a very broad question but if it's possible to specify the question... how long, generally, does it take to go from your first aerial firefighting job (even if it's as an FO on a P-3, if that's possible) to get to be captain on a P-3? A. We have some Captains who have been with the company for over 20 years, and over half of them have been in the business for that time. Progression from copilot to captain is slow. Typically you can expect a type rating no earlier than your third season. From there expect another two year wait to begin your captain syllabus. The captain syllabus typically takes up to two years to complete as it must all be done on the job.